One of India’s leading solar power project developers, Acme Solar, has significantly reduced the size of its Initial Public Offering. Indian business dailies reported that Acme Solar now plans to raise ₹1,000-1,500 crore ($151-226 million) through sale of equity at Indian bourses. The company had initially planned to raise around ₹2,200 crore ($332 million). The company is believed to have filed the draft red herring prospectus several months back but hadn’t taken any concrete action thereafter to actually offer shares in the open market. Acme Solar had planned to use the IPO proceeds to fund a 200 megawatt solar power project in the western state of Rajasthan. The company secured the project at the lowest solar power tariff ever in India — ₹2.43/kWh (3.67¢/kWh). However, the company is now well past the deadline for financial closure of the 200 megawatt (AC) project. According to company sources speaking to media outlets, Acme managed to achieve financial closure for the project through internal company accruals, cost cutting, and promoter equity. Hence, the company has now reduced the amount of funds it plans to raise from the IPO. Acme Solar has been a leader in driving solar power tariffs to the current lows. The company is also developing a 250 megawatt (AC) project at Rewa solar power park in the state of Madhya Pradesh. The project was the first in India to have witnessed bids of less than ₹3.00/kWh (4.5¢/kWh). 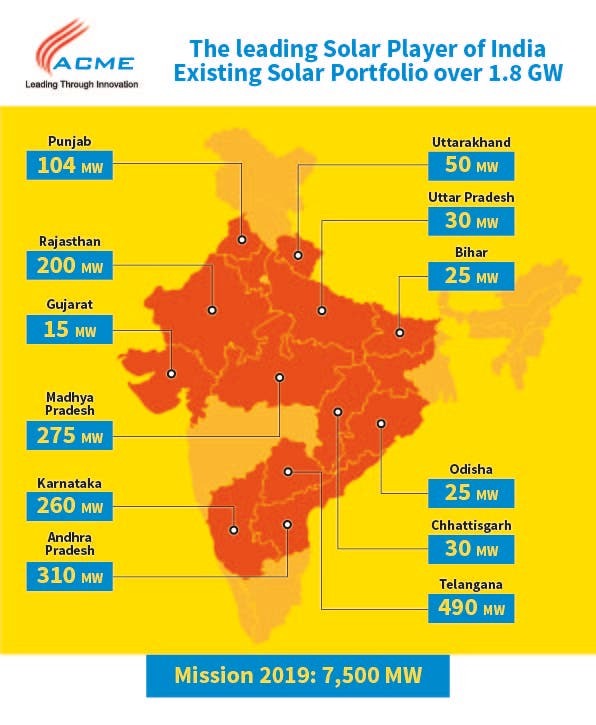 Acme claims an existing portfolio of 1.8 gigawatts spread across India. The company had planned to set up 7.5 gigawatts of renewable energy capacity by 2019.